Popbar has opened its first location in the West Village. 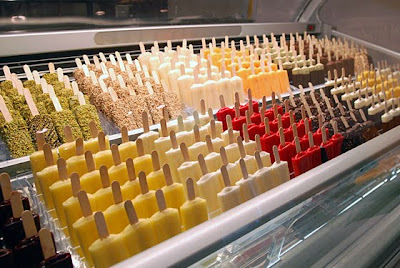 The aspiring chain sells all natural gelato, sorbetto, and frozen yogurt on a stick. There are 25 rotating varieties made daily. The best part is that you can get them plain or dipped in a variety of "poppings" such as brownie chunks, coffee grains, biscotti crumbles, chopped nuts etc, etc. I can't wait to try it! This is such a great business idea. I hope they open one in San Francisco! Great post. It's been really hot where I am recently and those pop sickles look DE-VI-NE!